Elite cycling coach Chris Carmichael has updated and improved his best-selling book The Time-Crunched Cyclist: Fit, Fast, Powerful in 6 Hours a Week. With this new edition, cyclists can get fit faster with 8 time-crunched training programs for road racing, cyclocross, mountain bike events, Gran Fondos, century rides, and multi-day tours-all in under 6 hours a week. The book is now available in bookstores, bike shops, and online. Preview The Time-Crunched Cyclist at www.velopress.com/crunch. Through his popular endurance coaching service, Carmichael noticed that many busy cyclists are unable to make performance gains using conventional training methods; they simply don't have enough time to train. Carmichael Training Systems developed a new approach-the Time-Crunched Training Program-to help cyclists achieve competitive fitness and power without the impossible time demands of traditional training methods. The Time-Crunched Cyclist shows cyclists how to build fitness on a realistic schedule by tapping the power of high-intensity interval workouts. Cyclists learn the science behind this alternative approach to training before performing the CTS field tests to get a baseline reading of their fitness. 8 comprehensive training plans include effective time-crunched workouts, nutrition guidelines, and strength training to develop the speed and endurance for a wide variety of cycling races and events. New programs for this second edition bring cyclists up to speed for cyclocross racing, mountain bike endurance rides, and show bicycle commuters how to turn their twice-a-day rides into effective time-crunched workouts. Cycling is more fun when you are fit, and now great fitness is achievable for cyclists who thought their best performances disappeared with their free time. Chris Carmichael was an Olympian and a professional cyclist before beginning his career as a coach and best-selling author. He was recognized as the U.S. Olympic Committee Coach of the Year and was inducted into the U.S. Bicycling Hall of Fame in 2003. 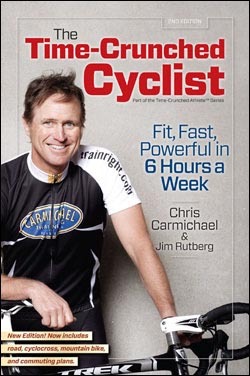 Jim Rutberg is the editorial director and a coach for Carmichael Training Systems, and co-author, with Chris Carmichael, of The Ultimate Ride, Chris Carmichael's Food for Fitness, Chris Carmichael's Fitness Cookbook, The Carmichael Training Systems Cyclist's Training Diary, 5 Essentials for a Winning Life, and innumerable web and magazine articles. His work has appeared in Bicycling, Outside, Men's Health, Men's Journal, VeloNews, Inside Triathlon. VeloPress publishes books for cyclists, triathletes, and runners that help beginners and committed athletes build fitness and achieve their goals. VeloPress celebrates the icons of endurance sports through history books, biographies, memoirs, and photography books. VeloPress is a division of Competitor Group, which publishes Velo, Triathlete, Inside Triathlon, and Competitor magazines and produces the Rock 'n' Roll Marathon series, TriRock triathlon series, and the Muddy Buddy adventure race series. For more information, please visit the all-new www.velopress.com.